ED NOTE: This page is still a work in progress. Florence Murdoch was born June 14, 1887 in Lakewood NY to James Riley Murdoch and Florence Carlisle Murdoch. Her older brother, Carlisle Murdoch, was born in 1885. Her father was president of the Miami Valley Insurance Company of Cincinnati. Her mother was an artist, known for china painting. Florence Murdoch was a 10th generation Mayflower descendent of Richard Warren, who came to America on the Mayflower. Although she was born in Lakewood NY, she lived her entire life in Cincinnati OH. Florence Murdoch was a painter, print maker, graphic artist, craftsperson, teacher, preservationist, and writer. She was a fairly well-known painter in her day, who lived in and worked from Cincinnati OH. 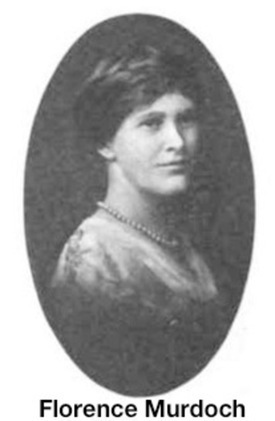 After graduating from Urbana University (which her grandfather, George Carlisle, helped found) in Urbana OH, her art education included: Cincinnati Art Academy, Art Students League of New York, Ohio Wesleyan University, and at the University of Cincinnati under Novotny, John Carlson, Sallie Humphreys, Meakin, Winold Reiss, W. Watson, P. Ensign, and Ernest Haswell. She was a member of the American Artists Professional League, the Women's Art Club of Cincinnati, and the Cincinnati Crafters Club. She exhibited annually in the Women's Art Club of Cincinnati's annual art show for many, many years. She had 16 solo shows between 1942-1960, including at the New York Botanical Gardens (1942), Ohio State Museum (1945), Missouri Botanical Gardens (1955), Boston Museum of Science (1956), and Dayton Museum of Natural History (1960). Florence Murdoch is listed in Who's Who in American Art (Gilbert, 1947 & 1959), Dictionary of Women Artists: An International Dictionary of Women Artists Born Before 1900 (Petteys, 1985), and Who Was Who in American Art 1564-1975 (Falk, 1999). She has an illustrated article in the January 1932 issue American Magazine of Art titled "Trailing the Bestiaries". 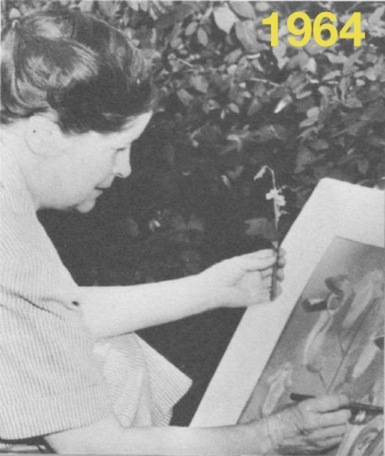 In 1957, she was awarded an Ohioana Library Award for her drawings in an historical calendar. Professionally, she taught art and crafts at various private schools and camps, including several years as art instructor at Oakhurst Collegiate School in Cincinnati, and as a crafts instructor at Camp Boulder Point in Inlet NY. She was also the organizer and director of the Junior Artist Clubs in Cincinnati. 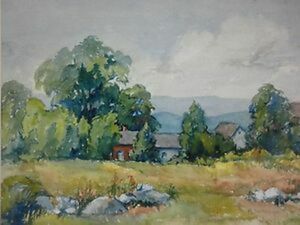 © 1964Although she was known as a landscape painter in oils later in life, earlier on, she specialized in watercolors, floral crayon drawings, and the restoration of art objects. Her Magniflora Americana (photo at right), a series of crayon drawings of tiny native flowers drawn ten times life size, was widely exhibited and made her name known. It was also displayed at the Cincinnati New Church in April 1962. Some of the flowers in this series were so small that she viewed them through a 30X microscope while she painted. Besides art, Florence Murdoch was also involved with the Cincinnati chapter of the Daughters of the American Revolution. She created an "artistic badge" for use at the D.A.R. 's 20th Continental Congress in 1911, and served as correspondence secretary in 1914, among other things. She held the copyright for a Cincinnati "sightseers' map" created in 1941. Florence Murdoch worked alongside her mother for over 30 years to preserve Cedar Bog in Urbana OH. 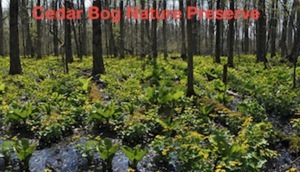 In 1942, six years after her mother's death, Cedar Bog Nature Preserve became the first nature preserve in Ohio to be purchased with state funds. It is a National Natural Landmark, and ranks the highest of any site in Ohio on the Floristic Diversity Index for its wide variety of plant species. The "Florence Murdoch Papers" collection at the Ohio History Connection, contains the two women's correspondence, newspaper clippings, and documents about their historic work to preserve this site. Another of Florence Murdoch's special interests was early Ohio history, and particularly John Chapman, commonly known as Johnny Appleseed. She collected one of the largest collections of Johnny Appleseed-related materials in the world. The 1945 book, Johnny Appleseed, a Voice in the Wilderness; the Story of the Pioneer John Chapman contains a chapter she contributed titled "The Arts Salute Johnny Appleseed" that is an extensive listing of poems, art work, books, articles, statues, buildings, trails, groups, and even a bridge that are about, feature, or named for Johnny Appleseed. 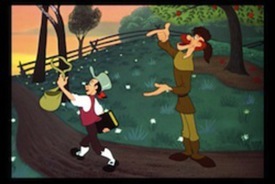 In 1948, after seeing a depiction in an ad for Walt Disney's Johnny Appleseed short that was part of the very-soon-to-be-released 10th animated film, Melody Time, Florence Murdoch wrote an impassioned letter to Walt Disney saying that she was pleased that it would include what Johnny referred to as his Blessings Three: "love and faith © Walt Disney 1948and an apple tree", but was concerned that the studio was taking too much liberty with certain other spiritual concepts, especially the coonskin cap-wearing guardian angel in the ad. She went so far as to suggest several changes. About a month later, after the film had been released (unchanged, of course), Disney's Story Department manager, Hal Adelquist, responded that they had researched the real life character extensively, saying: "We trust that after you have viewed the picture you will agree that we have treated the angel with sincere respect and endowed him with a certain dignity". Adelquist also said that this animated short was the closest Disney Studios had ever come "to a sermon on... brotherly love and unselfishness", with the implication that she should also be pleased with that. Seven years later, Florence Murdoch finally replied, saying she admired the treatment Johnny Appleseed got in the film and, in her typical style, went on to suggest an outline Disney Studios could follow to set up "Johnny Appleseed Junior Clubs". Joe Besecker, director emeritus of the Johnny Appleseed Museum in Urbana OH, said that Robert Price's definitive 1954 biography of John Chapman, Johnny Appleseed: Man and Myth, would not have been possible without Florence Murdoch's extensive contributions to Price's research. In the April 15, 1955 issue of The New-Church Messenger, Florence Murdoch wrote an over two-page review of Johnny Appleseed, Man and Myth, the first full-length biography of the man. In that same issue, there is also a lengthy letter to the editor from her about the Johnny Appleseed Collection in the New Church Library at the Cincinnati Church. At the end of her letter, she signs off as the Chairman of the Johnny Appleseed Club. Florence and her family were Swedenborgians for several generations on both sides of the family. The Murdochs were members of and regularly attended services at the Cincinnati Church of the New Jerusalem. As an adult, Florence served as secretary of the church for many, many years, as well as being the church librarian, where her Johnny Appleseed collection was then stored. She was also a Life Member of the Swedenborg Foundation. Miss Murdoch, a pear-shaped lady of great determination, used her snapping black eyes to underscore her opinions. 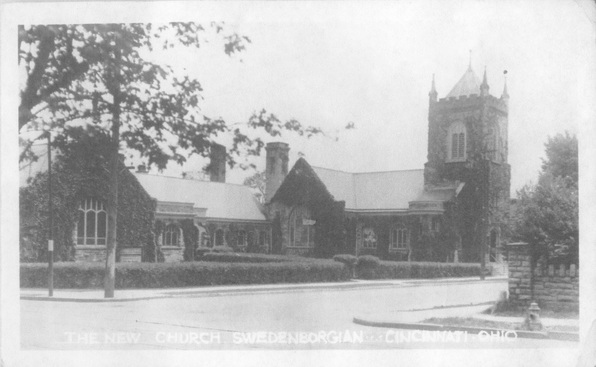 One of her enthusiams was Urbana University, the Swedenborgian college in Urbana, Ohio. She always encouraged we three children to become good readers so we could go to Urbana, since after Miss Wheelwright had gone to the spiritual world, Miss Murdoch had become the church librarian. As a young adult, Florence was active in the Cincinnati New Church League, the church's youth group, both as a member and on various committees. Digitized minutes of League meetings from 1910-1922 show that just in that time, Florence served as chair of the Social Committee, Correspondence Secretary, chair of the Extension Committee (5 years), Nominating Committee, Cincinnati League delegate to Convention (3x), delegate to the Ohio State church convention, as well as chair of 6 ad hoc committees for various purposes. She was also one of four members who submitted a design for consideration for the League "badge" (pin-back button) over the winter of 1912-1913. Florence was also active in our national youth group, the American New Church League (Swedenborgian Church Youth League now), serving on the League Directory Committee (1911), Executive Committee (1912-1913), and then the Extension Committee in 1915. The chair of the 1915 League Extension Committee had this to say about her in the March 1915 issue of the New-Church League Journal: "Miss Murdoch has written a great many letters of suggestions and offers to help the various Leagues. I count myself fortunate indeed in having had her services on my committee." And, in fact, the photo at the top of this page is from an issue the New-Church League Journal. As she aged out of the League, Florence Murdoch became active in the Alliance of New Church Women, that is, the Women's Alliance. 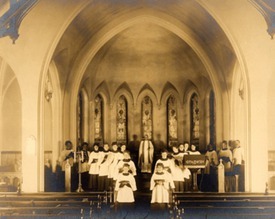 Around 1961, Florence Murdoch created an exhibition of the Cincinnati Church's treasured possessions in the church parlor for one of the church's sesquicentennial events titled "Handmaids of Religion: the Creative Arts". It included paintings, drawings, sculpture, carvings, architecture, ceramics, literature, drama, needlepoint, and crafts. In 1948, for the entire 3-week session, Florence Murdoch (age 61) was the first person to stay in the brand-new-that-year Taft Cabin. 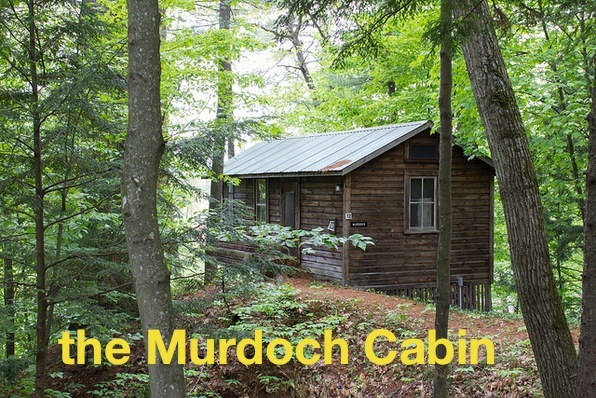 Evidently, she liked it very much, because the following Spring she funded the building of the Murdoch Cabin and stayed in it during camp pretty much every year for the rest of her life. Her cabin quickly became known as "the artist's cabin", a nickname still in use today. In 1949 and again in 1951, at the suggestion of Florence Murdoch, a Hobby Show was held at the Assembly in which several artists and crafters presented their work and plied their crafts publicly for everyone's enjoyment. Florence Murdoch died June 20, 1977 in Cincinnati OH, just 6 days after her 90th birthday.